Join The Nordlof Center and Notebook Entertainment as we celebrate the release of Rockford’s Sitcom The Deadersons Season One on DVD!! Whether you pre-ordered it or want to pick it up at the event, we will have DVD sets on hand to take home with you as well as Deadersons T-shirts! 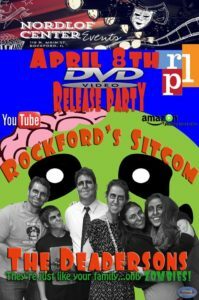 So, sit back and have a laugh on us while you support local arts, and take home Rockford’s only zombie sitcom. ← Previous Previous post: FML headed to DVD!